In an effort to pare debt at the group level, Emami group has announced the sale of 10 percent stake in Emami Limited helping it raise Rs 1,600 crores. Though earlier media speculation suggested a structured credit deal with the US private equity firm KKR, Emami group has instead gone for an equity deal with SBI Mutual Fund, PremjiInvest, Amundi, IDFC, L&T Mutual Fund. Proceeds from the stake sale will be used to reduce promoter debt raised for the group’s other businesses such as cement, solar power and others. Over the years, the Emami group diversified into 11 sectors ranging from edible oil to pharmacy retail with combined revenue of Rs 16,000 crore. In the last 10 years, it has reportedly acquired 10 companies or brands that include the Rs 1,650-crore Keshking brand and a heavy investment in cement sector of over Rs 4,000 crore. To finance this, the group has taken on huge debt at the conglomerate level. As per Crisil’s rating advisory, the group company, Emami Cement has a debt of Rs 2,179 crore. Emami promoters have pledged the shares of one of the group’s most profitable businesses — FMCG. It’s noteworthy that Emami’s profitability (Gross margin: 68 percent and EBITDA margin of 28 percent) is one of the highest in the FMCG sector. As per the last conference call, the promoter’s share pledge percentage is about 47 percent. So while the FMCG unit’s Debt/Equity ratio is low, a higher percentage of pledged shares worried investors in recent times. The equity deal has been struck at around the closing price of Emami stock on February 18. However, it rids investors of worry on the group level debt. We also expect a substantial part of the pledged shares to be released now. Pursuant to the stake sale, the promoter holding in Emami will be down at 62.74 from 72.74 percent earlier. The management clarified they don’t plan for any further dilution of stake in the foreseeable future. While the FMCG core business in itself is not in fine fettle, but there are improving signs of growth. In recent times they have been able to re-position key products like Kesh King range and Zandu Pancharishta. Further, concerns on account of domestic distribution are easing. Wholesale channel’s share has stabilised at 38 percent and direct reach has improved to near 9.25 lakh outlets, which is 50 percent higher than two years back. 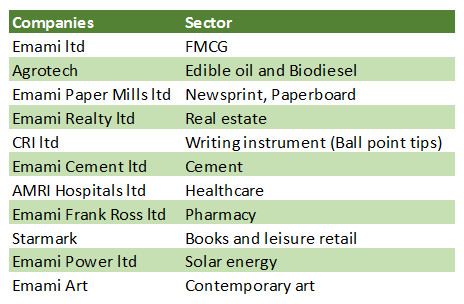 In the recent past, the stock performance of Emami has been in complete contrast with the trajectory seen for key FMCG leaders. While Emami has dropped 40 percent from its 52-week high, the market leader is trading close to its 52-week high. Emami is trading at 26x FY20 estimated earnings, nearly a 50 percent discount to leading FMCG companies such as Marico, HUL, Dabur. We see Emami group’s effort in paring debt as a significant development that would help Emami, as the percentage of pledged shares reduces to an acceptable level. We, therefore, expect the valuation discount between Emami and leading FMCG companies to shrink from here.